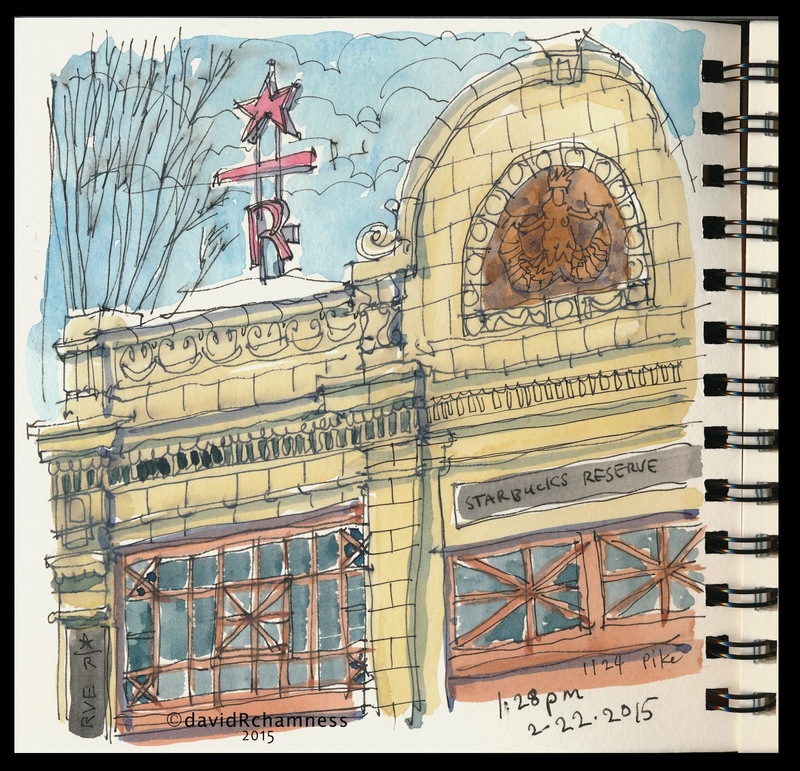 Today was a wonderful "winter" day for outdoor sketching in Seattle. Our location was the neighborhood on Capital Hill around the Melrose Market and the Starbucks new Reserve Roastery at the corner of Pike Street and Melrose Avenue. The turnout was fantastic with 30-40 sketchers. I started out at the NorthWest School on Summit Avenue. The next sketch was looking up Melrose Avenue trying to capture the whole facade of the market. I had many curious persons stop and ask what was going on with all the people creating art today. 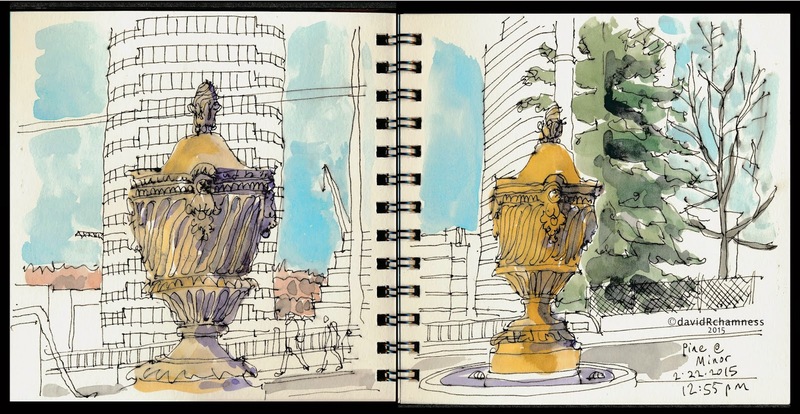 The sculptural urns from the old Emerald Palace Theatre that was demolished in 1991, was my next stop. A pocket park was created on Pine Street @ Minor Ave. with three of the salvaged urns on display. 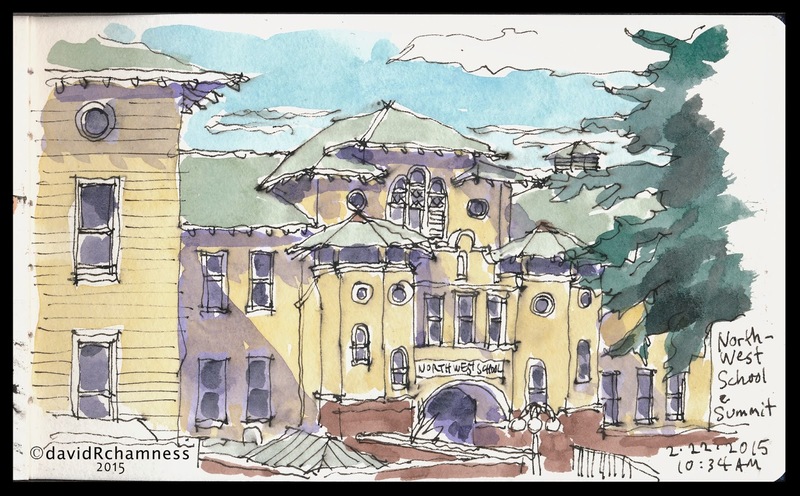 I have a sketch of the Emerald Palace before it was so wrongly demolished in my archives. The last sketch was a quick one as we were about to gather and share our sketches. I had to add the color at home, not my first choice for capturing sketches "en plein air". Very nice! I like how you concentrate on the interesting bits while also providing context that doesn't overpower. I also like how you are not slavish about producing straight lines. Love these, David. Love the way you can put out several great sketches in such a short time and get all that's important in them. These are simply stunning, David. I'm glad to get another chance to look them over after seeing them in person for just a short time. Love the choice of format to express each subject.